If you've read any of my previous blog posts you may have guessed by now that I see scanning as the dark art of the hybrid analogue/digital workflow. Using a standard Epson V500 I’ve been scanning my negatives for almost four years and frustratingly still have not achieved enlightenment. In February I finally purchased CF Systems ColorPerfect plug-in. Until now I felt that although inconsistent the results from the V500's bundled EpsonScan software were acceptable and the use of additional software would not be worth the disruption in workflow. EpsonScan generally does a good job of converting scans, automatically applying black, grey and white points, but it can also be hit and miss. Disconcertingly on occasion, I've even found that two shots taken in the same light directly one after the other could look very different in preview. It’s not the scanner, it's the software. The automatic initial adjustments applied are exactly that, automatic and adjustments. If these adjustments are there or thereabouts, then making small modifications is straightforward enough. However getting control of these adjustments within the EpsonScans interface for anything more profound is not easy and so inevitably is done in Photoshop. In reality using Photoshop to correct EpsonScans limitations. So eventually tiring with EpsonScans variable results I thought why not try another way? It is not my intention that this is a review of ColorPerfect, for me it's too early for that but I have found the process of making RAW or Linear scans of negatives to be beneficial. By scanning negatives with no adjustments seemingly all information on the negative is captured. I now think of scanning as a three-stage process. Scanning which is just that, scanning the negative as a negative, no adjustments, no sharpening, no dust removal. The next stage is conversion from negative to positive and the removal of the orange mask. Finally, colour correction, finding mid grey, contrast, highlight, mid-tone and darks adjustment. In a conventional workflow scanner software such as EpsonScan or VueScan work to produce a final colour corrected scan in-line with all stages happening together in one process or it can be broken down and done separately, as I now currently prefer. I hoped ColorPerfect with its vast library of film emulsions would somehow magically convert negative scans to positives while retaining the basic colour characteristics of each film type. The truth is as I see it, that ColorPerfect is a database of orange masks used to convert negative to positive. Thereafter its features are much the same as any other colour correcting software and in common with EpsonScan getting control of these adjustments is no easy process in ColorPerfect either. ColorPerfect has some excellent colour correction features but they are hidden behind a difficult user interface that is neither intuitive nor graceful. It does, however, convert an unadulterated negative scan to positive. A scan that includes all information, effectively removing the orange masks and thereafter ready to go to Photoshop for the all-important final process of colour correction. I have no doubt that Adobes post-processing either in Photoshop or Lightroom is more powerful, more adjustable and more user friendly than anything scanning software can offer and in this workflow there is no need to correct their limitations either. The conclusion? 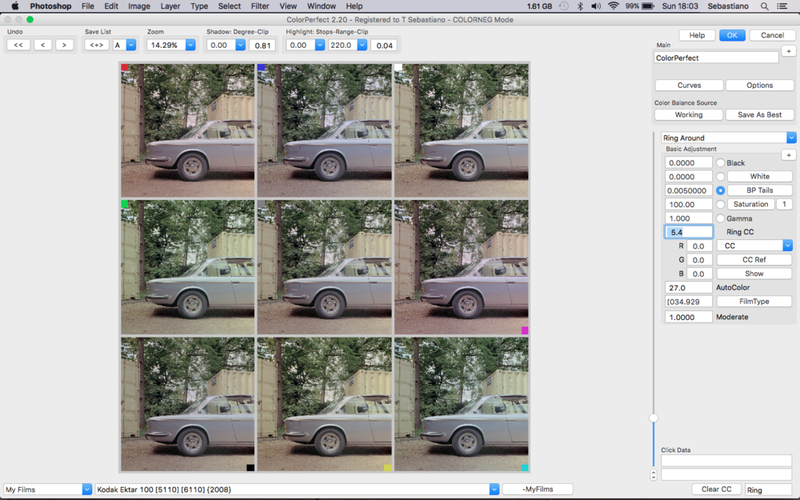 Well as yet for me, there isn’t one, only progress because colour scanning still remains a dark art.